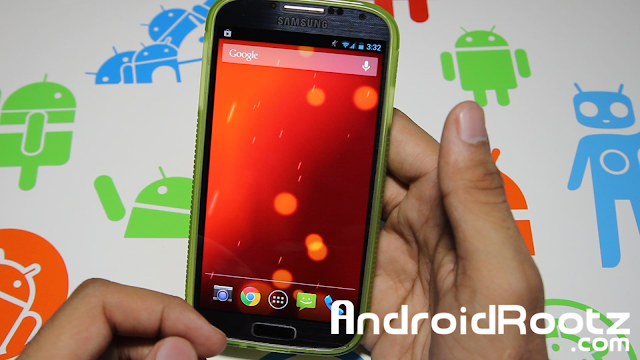 Google Play Edition ROM for Galaxy S4! ~ AndroidRootz.com | Source for Android Rooting, ROMS, Tricks and More! With the recently released Google Play Edititon phone like the Galaxy S4 and HTC One it was only a matter of time until someone ported them over to the other variants of Galaxy S4. This Google Play Edition ROM port includes everything that the original one has and everything works flawlessly! The Google Play Edition ROM port will work for the Galaxy S4 GT-i9505, AT&T, T-Mobile, Verizon, and Sprint! This was the first AOSP ROM I installed on my Galaxy S4 since I got it and it is so much better than Touchwiz. You get more memory storage, no lag, and just a clean smooth UI. Since this leak was from the Galaxy S4 Google Play Edition, Android should take full advantage of the hardware, especially the Quadcore Snapdragon! There are two version of this ROM, one is running on Android 4.2.2 and comes pre-rooted, while the other one is running on Android version 4.3 and doesn't come pre-rooted, however Chainfire has found a way to root the Android version 4.3 for the GT-i9505, AT&T, and T-Mobile. If your running on Verizon or Sprint use the Android version 4.2.2 specifically for your Galaxy S4 variant! Download the Android version 4.2.2 or 4.3 of Google Play Edition ROM and flash it. Do Not Reboot Your Device. Flash Loki Doki then reboot your phone. 1. Flash the 4.3 Google Play Edition ROM (link below). 3. Download SuperSU-JWR66N-S005-130625-1.41.zip to your phone. 4. Enter back into recovery mode and flash the SuperSU zip file. 5. Reboot your phone, if you asked to disable stock recovery choose "No".